The book is also available in Canada here. John Perry Barlow, who died this year at age 70, was a Grateful Dead lyricist, a pioneer in the fight for online civil liberties, and possibly a mutant. 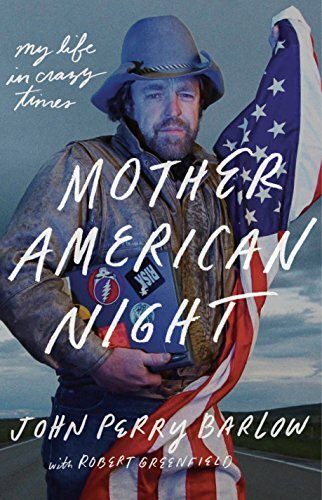 As Barlow recounts in his posthumously published memoir, Mother American Night, his mother as a girl was treated for tuberculosis by a quack who administered a prolonged beam of X-rays right into her hip. Forty-five minutes of this treatment gave her radiation sickness. Her hair fell out, she suffered severe burns, and she was informed that, oops, she’d been sterilized. The sterilization didn’t take. Two decades later, in 1947, she gave birth to John Perry Barlow. One of his X-Men superpowers seems to have been to unerringly locate centers of the American zeitgeist and discover some pivotal role he could play in them.